In my initial draft of this review, I didn’t complete Evoland 2. I was frustrated and tired, however the very next night I returned. 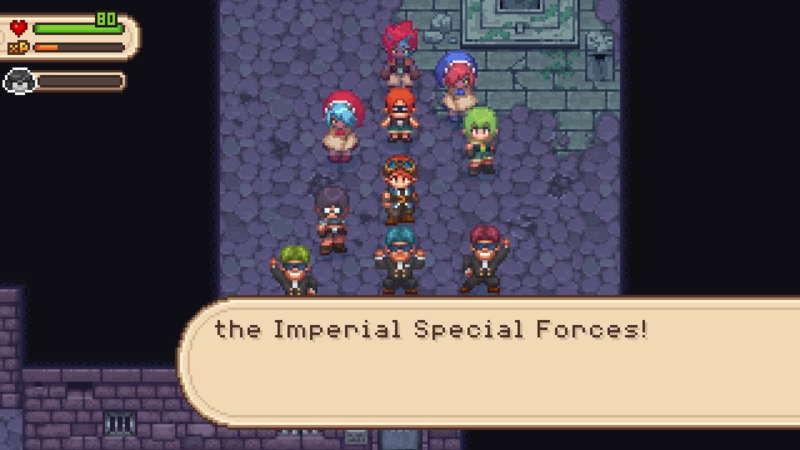 Perhaps that was Evoland 2’s greatest strength. It’s not about the story or the moment-to-moment gameplay. It was my own curiosity that brought me back. I wanted to see what was coming next, be it a brand new gameplay mechanic inspired by a classic RPG, or an obscure reference to a modern game released in the last few years. If the original Evoland was considered a memorial to the history of video games, Evoland 2 exists as a celebration of what makes them great. I feel it’s necessary to bring up the original Evoland before diving into Evoland 2 (the Ludam Dare entry is mostly just the first 1/3 of the Retail release, so I consider it apart of the same package). Evoland, as the name suggests, is about the “Evolution” of games, as told through a simple (and mostly referential) RPG story. Rather than upgrading your character, you upgrade the “world” and the “rules” that govern the game, starting from a simple 8-bit RPG to a semi-open 3D action adventure platformer. The first Evoland was clever. Although it’s been two years since it’s ship, I remember it fondly as an interesting experiment in creating a game that evolved in mechanics and visual presentation. However, I also remembered it not being a particularly enjoyable game to play. While it jumped between playstyles and mechanics frequently enough to keep me attached, very little of it ever felt well executed in design. These segments served as a great reminder of what games in their style were like, but it lacked the polish needed to actually sell the experience of playing those games again. At the very least, the game moved quickly enough through these segments that they never stayed around long enough to become irksome. What the first Evoland really succeeded on was its charm. There was a clear passion for the classics from developers Shiro Games. While the gameplay may have suffered in places, it didn’t diminish their representation of their inspiration. 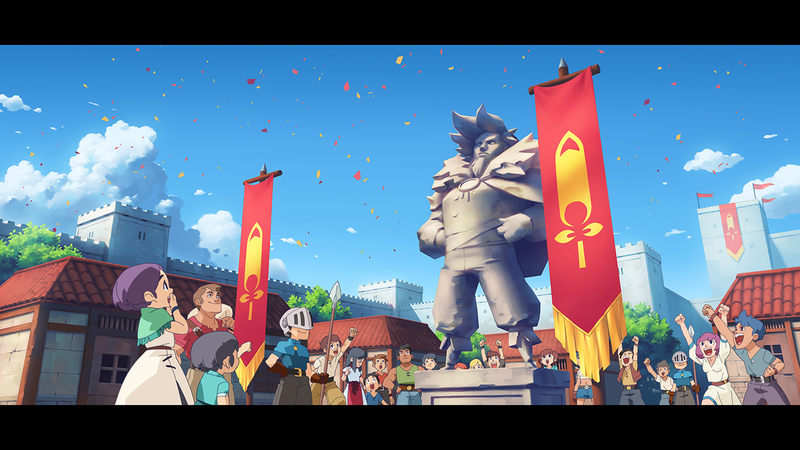 Shiro’s love of games as a medium made Evoland a special experience to play, and supported the bulk of the game through its clever weaving of classic references and mechanical changes through the ages. Evoland 2 isn’t a remastering, or even a revisit of the first Evoland’s structure. If we were to consider Evoland as a prototype or a proof of concept, Evoland 2 would be the resulting full game. Although, even that isn’t the best comparison. If anything, Evoland 2 is structurally most similar to Chrono Trigger, and it tells its own unique story. Rather than directly trailing between game references and classic game interpretations, Evoland 2 scatters the player through three eras of game development. Unlike Evoland 1, there’s no chronological order that these interpretations are presented. The rules of gameplay change on the fly and video game references are far more wide reaching and, in some instances, cleverly more hidden. 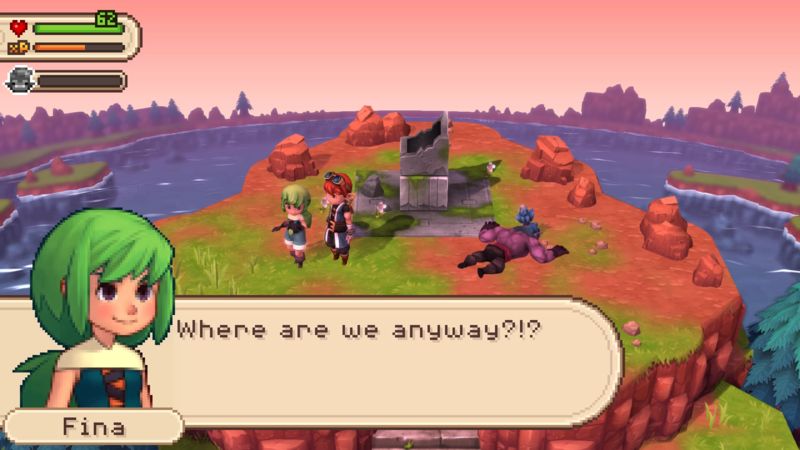 It’s a nice change of pace coming from Evoland 1, and kept me on my toes through the entirety of the game. The first Evoland was a short, clocking in at just over 3 hours. By contrast, I finished Evoland 2 with 70% completion at nearly 13 hours (with a full completion likely requiring a couple more hours of play). There’s far more confidence in the game design this time round, not without reason too. The scattershot gameplay changes are complimented with some persistent systems. Kuro, the game’s main character, levels up through the game which provides a pre-determined boost in Attack power, Defense, and Health for every level-up. These stats carry over through the many gameplay changes, which can manifest in interesting ways depending on the current situation. There’s also a full party of characters this time around, each bringing their own ability side ability that Kuro can use through his quest. This ability manifests in different ways depending on the current gameplay style, providing some further personality to the small cast. The gameplay mechanic changes are where the core of the game comes to life. The first half of the game is mostly a linear experience, setting up the hero’s journey and establishing all four characters and the three eras (each presented in a different art-style). This first half mostly features gameplay elements evocative of the graphical style of that “era.” In the “Future,” you’re exploring an action-adventure dungeon in 3D. 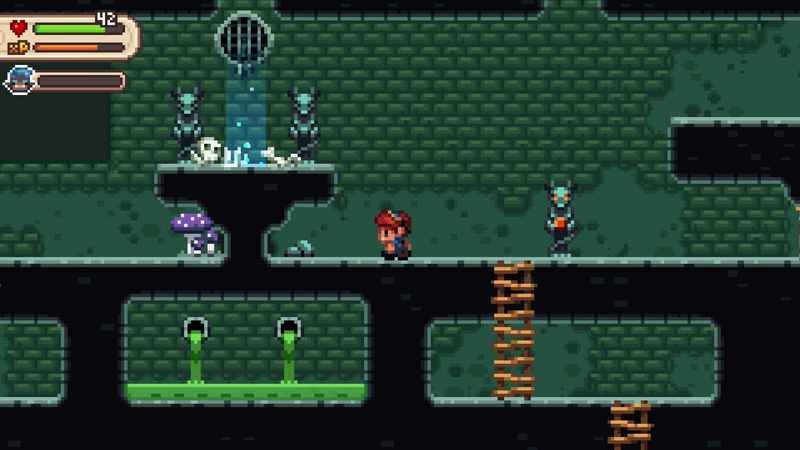 In the “past,” you’re farming for gold and navigating through dungeons evocative of Earthbound or Zelda 2. Eventually, the game opens up and gives Kuro the power to switch between eras at will, with an open-ended quest to gather a set of items to form a key item that will save the catastrophic event that destroyed their future. It’s at this point that the gameplay starts to go wild. 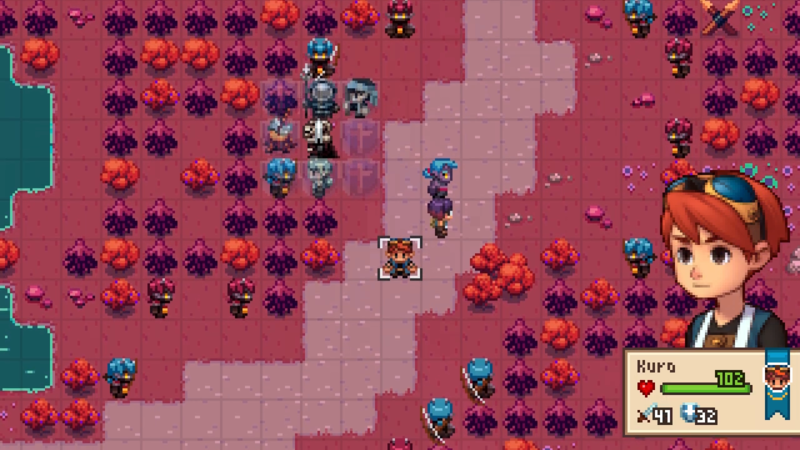 At one moment, you’re fighting in a turn-based strategy game. Next, you’re playing an arcade-era beat-em-up. I would be doing an injustice to the game if I spoiled all of these twists here. These segments drop onto the player with little warning, making for a nice surprise when the game’s UI suddenly changes and you’re playing an entirely different game. However, I’ll loop back to what I mentioned at the very start of this review: I nearly quit the game during one of these segments. That’s not necessarily a negative on that specific segment (if you’re curious, it was the arcade beat-em-up). It was more a complaint on the overall pacing of the game. Evoland 2 is a much longer, and while the gameplay mechanics are far more mature and better constructed then it’s predecessor, many of these segments dragged on far longer than they should have. There’s a tightness to the balance design in difficulty, and even playing on the easiest setting will see Kuro and his gang getting out of most segments with just enough health to survive. The game handles the player’s inevitable death by allowing XP gained in a single attempt to cross over to the next. While this gives some vision of progress through multiple retries, it can still be very frustrating to have to replay a full segment just because you died inches away from the next checkpoint. 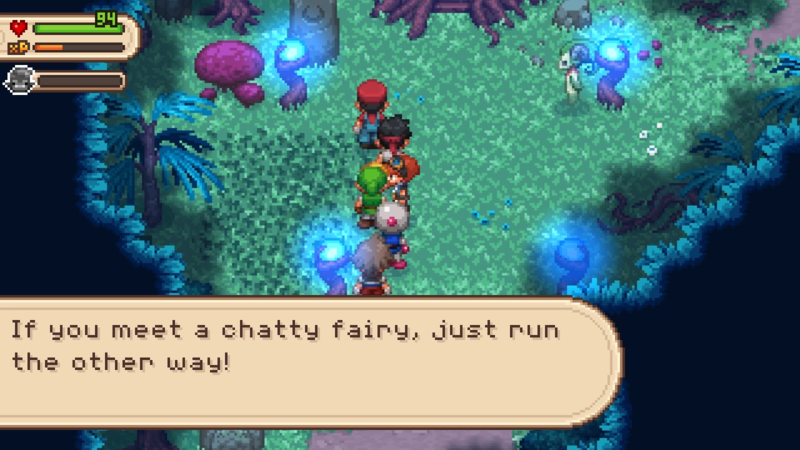 However, I believe Evoland’s greatest weakness lies deeper in its structure. With the first Evoland, most of the changes to gameplay mechanics come and go before they have time to sink in. By contrast, Evoland 2 lives in these moments. While they are built with a greater understanding of the mechanics from their inspiration, the skills the player learns through one segment don’t carry over to the next. It’s an issue that’s inherent at the core of Evoland 2, and seems as if it’s mostly unavoidable with the type of game presented. Most games teach the player a single mechanic over the course of the game, allowing them to get better as they spend more time in its world. Every time you switch between a gameplay segment in Evoland 2, you lose the knowledge learned in that segment, as it’s entirely irrelevant in the next. It’s an interesting problem from a design perspective, and one that hasn’t really needed an answer until a game like this came around. Mostly a game can fail when it doesn’t know what it wants to be and tries to offer too much at once. Evoland 2 is the opposite. It’s a game that is all about being everything at once. By nature, it needs to jump genres to keep its premise alive, yet when it hangs too long on a single element it starts to suffer, especially with the knowledge that all skills gained by the player in that period will be lost when the next one starts. It’s hard not to think of Evoland 2 by its parts in this respect, which when addressed individually first appear great, but quickly become taxing, especially after dying and retrying the same thing over and over, knowing that the really isn’t going to be much that changes until the next segment emerges later on. It’s in this moment that I nearly quit the game, as I couldn’t see pushing myself past the challenge one more time. To the game’s credit though, the intrigue of what’s to come was enough to bring me back long enough to finish it. I feel like I’m being harsh. The story was rather well conceived, even though most of the plot can be decoded roughly half-way through the game. The dialogue was exceptional as well, breaking the fourth wall in clever ways. Even the game’s direct references to other franchises are charming and surprising (although in cases it’s more surprising that it didn’t trigger a cease and desist). Ultimately, I’m positive on Evoland 2. As a complete package, Evoland 2 is a good game. Even though I won’t see myself coming back to fill out the last 30% of collectables I missed, I’ll still think fondly of the game. With the current tsunami of indie games flooding the market, I think that’s enough to keep it memorable.